Any self-respecting gadgeteer knows a beastly home cinema set-up needs an equally epic speaker system to go with it. Enter, Fidelio E5. Philips has launched a spiffing new audio system - the Fidelio E5 - designed to give your home cinema set-up a serious beat-blasting upgrade. The E5 offers hi-def sound completely wirelessly, pairing to your devices with easy-peasy one-tap NFC connectivity. 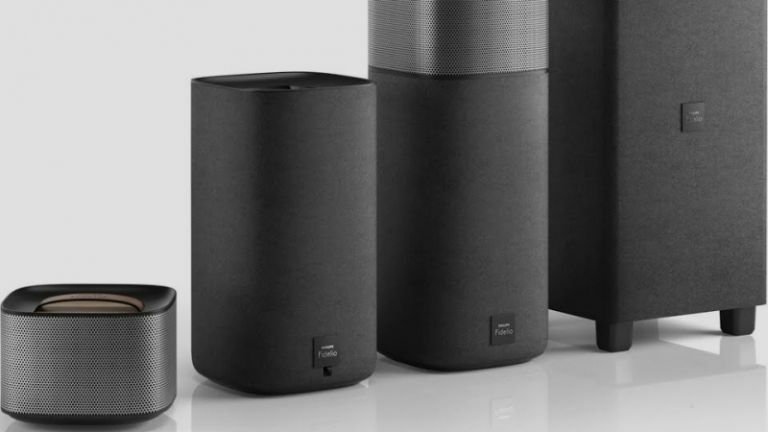 "Philips Fidelio E5 speaker system is the ideal solution for high definition home cinema audio without the clutter of multiple wires and boxes," says the tech firm. Just like the award-winning Fidelio HTL9100 soundbar, the E5 speakers have removeable lids that also act as independent speakers. This means you can up your audio game from a meagre 2.1 stereo set-up to a full 5.1 surround sound system, courtesy of the E5's quirky detachable tops. The towers recognise when you re-dock the satellite speakers, and will act as a whole 120W speaker once again, as well as re-charging the detachable unit's battery. Each of the towers boast a 3-inch full-range driver with its own soft-dome tweeter, while the smaller detachable speakers sport their own 2.5-inch full-range drivers. The Fidelio E5 system offers two HDMI input ports, capable of replaying Dolby Digital or DTS 5.1/7.1 sound from your media set-up - be it a TV, blu-ray player, or console. The new kit is available from today for £600 over at Philips' online store.